9:20 there is no significant economic news so this is a "digestion day"
5/9/2014 11:03:50 AM MT Sharpe:: Ugh, I missed that continuation buy. Was overly focused on the down side of things. 5/9/2014 10:35:09 AM MT mtt:: Hi Al & All - visitor here - I'm very interested in the MoonTide trading projections and wondered how/if those projections have been factored into todays trades and how? thank you. 5/9/2014 10:27:31 AM MT Sharpe:: Al, I noticed you just mentioned that we were in move 4 of a down CC from today's high. 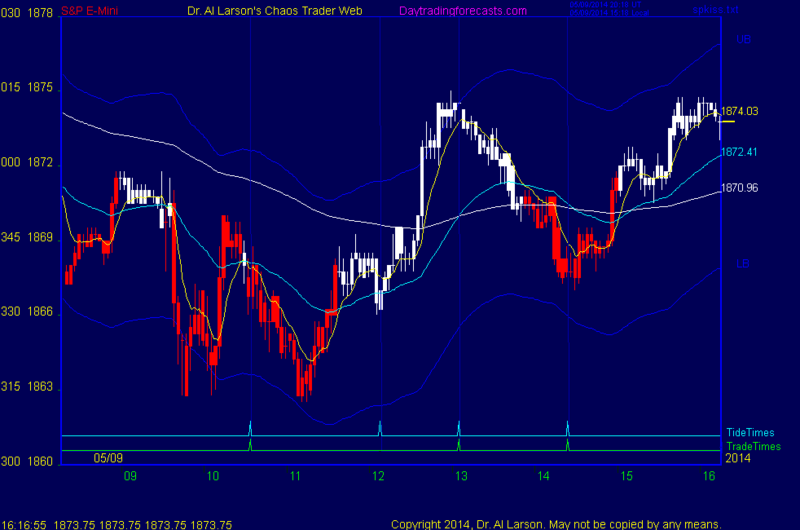 How do you take into account the move we had from the high yesterday? Did we complete a Fractal and simply start another one? 5/9/2014 9:17:01 AM MT Sharpe:: What made you sell again after you got stopped out Al? 5/9/2014 8:10:57 AM MT Sharpe:: I did do that but it said I needed to send you an email to validate it. 5/9/2014 7:57:53 AM MT Sharpe:: I just started working on the CTME Course last night Al and I sent you an email to get the indicators. So far it seems like an excellent course.